I happened to be chatting with Bob Celeste of GS1 Healthcare US yesterday at the LogiPharma conference in Princeton, NJ where he was about to speak, when he found out that version 1.1 of their guideline had just been published on their website. 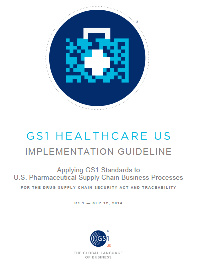 The full title of the 137 page document is “IMPLEMENTATION GUIDELINE, Applying GS1 Standards to U.S. Pharmaceutical Supply Chain Business Processes FOR THE DRUG SUPPLY CHAIN SECURITY ACT AND TRACEABILITY R1.1 — SEP 12, 2014”. You can download a free copy from their web page. I will have more to say about this document in a few weeks when I have time to review it more fully, but this is the long awaited update that brings the earlier version up-to-date with the Drug Supply Chain Security Act (DSCSA). The 1.0 version of the guideline, published in March of last year, was aimed at meeting the California Pedigree Law which was preempted with the enactment of the Federal DSCSA (see “The New GS1 Healthcare US Track & Trace Guidance”). The most significant thing about this version of the guidance is that it incorporates the lot-based additions to the GS1 Electronic Product Code Information Services (EPCIS) and GS1 Core Business Vocabulary (CBV) standards that were ratified in the spring (see “GS1 Ratifies Updated Versions of EPCIS and CBV”). Prior to that update, the GS1 EPCIS standard was only usable for documenting supply chain activity of serialized product. That then required a major update to the Implementation Guideline. The publication of this document represents the culmination of a lot of work by Bob and the members of the industry who participate in the Pharma Traceability work groups of GS1 Healthcare US. Congratulations to all of you!